Worst American Idol Post. Ever. Yes, that's me. 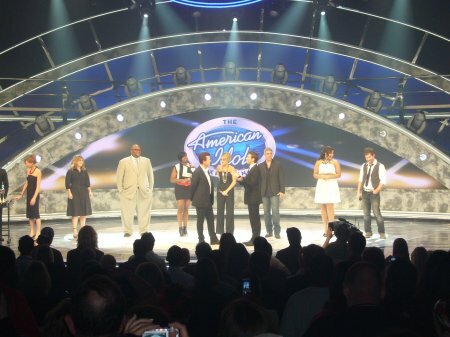 Yes, I am singing on an "American Idol" stage. No, I have no idea what I am talking about when it comes to that show. Let's back up a bit, shall we? Remember that Disney trip from a few weeks ago? I went as part of a media showcase for ModernMom.com. Part of that showcase involved participants shooting short promos highlighting different aspects of a Disney vacation. Someone else was supposed to sing. She ended up not making the trip. I'm a sucker for an audience and I like to sing. Earlier in the evening, Disney held its offical opening party for a new attraction called The American Idol Experience. Basically, if you've got stage talent, you could actually sing your way to the real American Idol by doing well on the AI Experience stage. To kick things off, Disney threw a star-studded party attended by Idol stars from past seasons. I don't watch American Idol. I had no idea who half these people were. But I made a video about it. I apologize in advance to any fans of the show who may be reading this. I was so unaware of the greatness in which I was basking. So what does this video include? Footage of famous people. At least I think they were. I just pointed my camera in the direction of the loudest "SQUEEE"s.
Shout outs from Diana DeGarmo, Sanjaya and David Cook. Me on stage being filmed for the promo. The finished promo video is on Modernmom.com. So what does this video NOT include?